We humbly request for Your Holiness’ attention to the message below. The Hong Kong Karma Kagyu Lineage Centre (formerly known as New Horizon Buddhist Association) was established by His Holiness the 14th Kunzig Shamarpa in 2004. We have about 100,000 members in Hong Kong. Over the years, our centre has hosted and conducted countless numbers of dharma activities, including the Thousand Arms Chenrezig Nu-Nhey twice a year. His Holiness Shamar Rimpoche also completed the entire teachings of the Moonlight Mahamudra as well as the Sutra Alankara from beginning to end at our centre. We are proud to be the only Vajrayana centre in Hong Kong that has ever completed the teachings of these two profound Buddhist texts. Our Buddhist centre strictly adheres to the principles of Lord Buddha and we have no record of deceiving people in the name of Buddhism. Once again, we have to humbly request your Holiness’ kind attention to our deepest concern. The Karma Kagyu (H.K.) Buddhist Society of Hong Kong, which claims to be the follower of H.H. Karmapa Ugyen Trinley of Dharamsala, has recently conducted ceremonies that are harmful to the Karma Kagyu sect, and to Buddhism as a whole. Our concern is that the so-called Buddhist ceremonies were conducted in an unsatisfactory manner, which will be elaborated below. 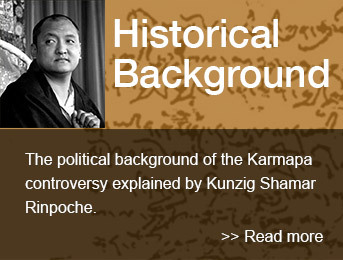 Throughout the ceremony, it was also repeated that the Karma Kagyu (H.K.) Buddhist Society and Thrangu Rimpoche’s centre are the only Karma Kagyu centres in Hong Kong approved by Your Holiness the Dalai Lama. They often referred to Your Holiness’ name (to “qualify” and “justify” such wrongdoings) and it is also our concern that this may also tarnish Your Holiness’ name. Thrangu Rimpoche conducted the entire ceremony from his throne on the stage. We know for a fact that in Tibet and any Himalayan countries, offering khataks to Rimpoches and lamas is free. The above-mentioned acts of corruption in the name of Dharma must be stopped. This will not only create a negative impact on Tibetan Buddhism, but also shed a grim light on all Buddhists in the world. As this is a very serious matter, all the members and Directors of the Karma Kagyu Lineage Centre are very concerned, and we have consulted our center’s founder, His Holiness. Shamar Rimpoche , on how to resolve this problem. His Holiness Shamar Rimpoche said that since the Karma Kagyu (HK) Buddhist Society and Thrangu Rimpoche’s center were associated with Your Holiness, it is best to inform to Your Holiness of this matter. activities in the name of Karma Kagyu which may be interpreted as corrupt by the public.